George Woods was created by owner, woodcrafter and designer Sally Yarwood over 27 years ago. When she founded the business, she felt at the time that being a women, people would not perhaps take her seriously, within this largely male dominated industry of carpentry. So George woods was Born, well knitted by her sister and quickly became the company mascot. Isn't he a handsome fella? 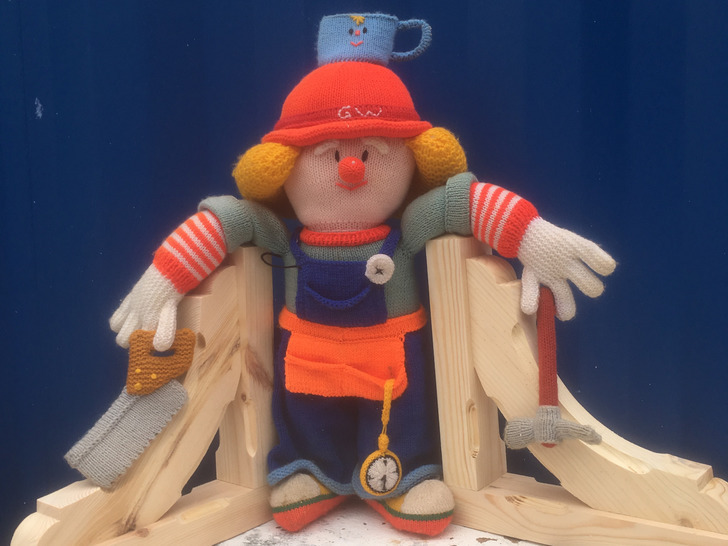 He has fun times out and about on site helping out with the sawing. George has largely been the face of this ever growing, successful business in the heart of Devon. We proudly supply timber door canopies to help breath new life and bring character back to homes across the land. 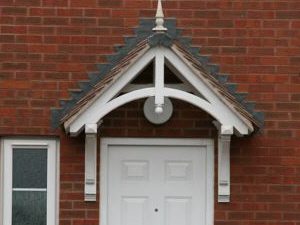 Well we simply make beautifully, crafted, timber door canopies/porches. 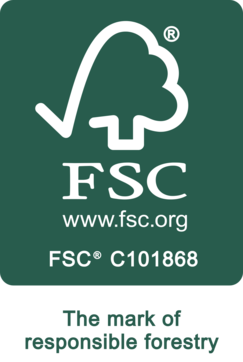 We use only the finest red cedar wood to make our timber door canopies, using timber from sustainable forestry. We replicate as closely as possible the patterns created in the last century, often by local carpenters, styles which still seem well proportioned, graceful yet functional today. Your canopy is delivered to you part assembled for ease of fitting, except for the tiles. We also supply full installation instructions, which are all well within the capacity of the average handyman. 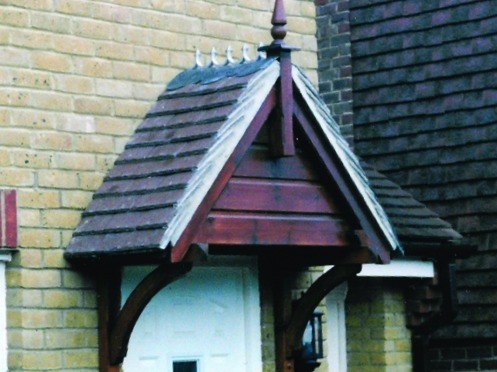 Everyone has seen the beautiful old door canopies still to be found in villages and towns throughout the country. For hundreds of years decorative woodwork has been used to enhance otherwise plain cottages and houses. However the practice came to an end in the thirties. Since then we have had decades of unattractive, plain housing design, unrelieved by any decorative feature. Now an interest in external decoration has revived. Decorative brickwork and woodwork, doors, windows and tiling are appearing on new properties and many older houses are being renovated with the restoration of the original period features. This is a movement certain to continue as builders and home owners seek to improve the value and appearance of their homes. Fitting an all timber canopy gives immediate visual impact and a cosy, homely and welcoming atmosphere as you approach your front door. Local estate agents have told us that installing a canopy can increase the value of your house by £1000.00 due to the instant kerb appeal.